You might associate ping-pong with suburban basements or musty recreation rooms, but the game has a historic legacy, a global following, and is currently enjoying a newfound popularity. Here are 12 facts about the English parlor game turned Olympic sport. 1. PING-PONG LIKELY BEGAN IN ENGLAND. The true origins of Ping-Pong are murky, but most historians of the game say it began in Victorian England. Lawn tennis had taken Great Britain by storm, and aristocrats wanted to play the game indoors. They transformed it into a parlor pastime, using the backs of cigar boxes as paddles and stacks of books as improvised nets. Meanwhile, others think British military officers invented Ping-Pong while stationed in India or South Africa. Eventually, they brought it back with them to their homeland. 2. A SAVVY ENTREPRENEUR OFFICIALLY TRADEMARKED THE GAME. According to the International Table Tennis Federation, the first person to try to patent the parlor game was an Englishman named James Devonshire. He called it “table tennis,” but records show that Devonshire, who filed the patent in 1885, abandoned it by 1887. Other reports state that an Englishman named David Foster patented the earliest surviving table tennis set in 1890. John Jacques, founder of English sports manufacturer John Jacques and Son Ltd., is credited with officially commercializing Ping-Pong in 1901. He laid out official rules for the game, which he called “Gossima,” and started selling equipment to the public. Meanwhile, competitors launched their own less-successful versions, including "Whiff-Whaff" and "Flim-Flam." Gossima didn’t take off, so Jacques re-branded it as as “Ping-Pong” after the sound the balls made when they bounced. According to legend, he also introduced the now-ubiquitous celluloid Ping-Pong ball, which replaced heavier cork or rubber ones as the game’s de-facto projectile of choice. The new ball made the game easier to play, and it slowly became more popular among the masses. 3. PING-PONG IS PRETTY MUCH THE SAME THING AS TABLE TENNIS. Eventually, Jacques gave up the game rights to English game distributor Hamley Brothers and the American board game company Parker Brothers. 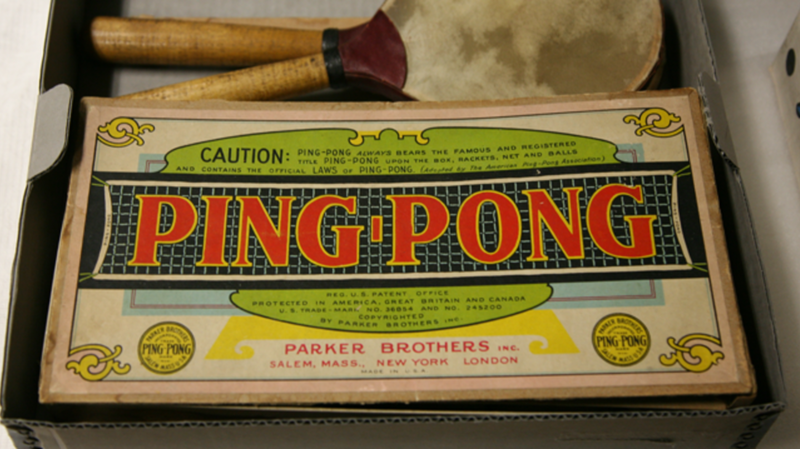 Since they now owned the name “Ping-Pong,” others who emulated the game had to call it something else. Many countries—and players—around the world stuck with the name “table tennis,” which the game had been called in its early years. Separate "Ping-Pong" and "Table Tennis" associations were also formed, and they sometimes had different rules. (The Table Tennis Association and Ping-Pong Association, which were both formed in England in 1901, eventually merged into one group before dissolving in 1904). Today, the sport is officially regulated by the International Table Tennis Federation. Some purists say that only dilettantes call the sport "ping-pong," whereas more serious practitioners prefer the name "table tennis." 4. PING-PONG IS A GLOBAL PHENOMENON (BUT IT'S MOST POPULAR IN ASIA). In the early 20th century, the ping-pong craze swept across Central Europe. However, the game’s success was short-lived. The trendy hobby soon faded in popularity, though it later experienced a revival in England in the 1920s. In 1926, the International Table Tennis Association was formed in Berlin. The same year, London hosted the first World Table Tennis Championships. Gradually, official ping-pong organizations began popping up around the globe. Although it's said that ping-pong was introduced to the Far East by British army officers in the early 20th century, it officially became an Asian phenomenon in the early 1950s. By the time the 1952 Ping-Pong Championships were held in Mumbai, Asian players were dominating the scene. That year, Japan won four gold medals. Soon after, Mao Zedong declared table tennis as China's national sport—likely because the International Table Tennis Federation recognized the Communist Chinese government in Beijing. China won its first World Ping-Pong Championship in 1959. Currently, it holds more Olympic gold medals in the sport than any other nation. 5. HISTORY'S BEST PING-PONG PLAYER IS A SWEDE. The English invented ping-pong, and the sport is currently dominated by the Chinese. However, it's a Swede named Jan-Ove Waldner who is often recognized as history’s best ping-pong player. Thanks to his multiple Olympic and World championships medals, he’s called the “Mozart of table tennis." 6. IT'S ENJOYING A COMEBACK. Once associated with musty recreation rooms, ping-pong is now a bona fide social trend. Ping-pong bars like New York City's SPiN allow patrons to compete against in one another in a nightclub-esque atmosphere, and resorts like Forte Village in Sardinia, Italy advertise themselves as “luxury table-tennis resorts.” Since the International Table Tennis Federation reports that some 300 million people play ping-pong, it looks like these businesses won’t be hard-pressed for patrons. 7. IT'S IN THE OLYMPICS. Ping-pong became an official Olympic sport at the 1988 Summer Olympics in Seoul. Currently, there are several event categories, including men and women’s singles and team matches. 8. IT HAS INSPIRED INVENTORS. Daniel Thompson, inventor of the bagel machine, passed away in September 2015. While he was lauded for his game-changing culinary creation, he was also remembered for revolutionizing recreation rooms across the country. One of Thompson’s lesser-known but equally recognizable creations was the foldable Ping-Pong table with wheels. 9. IT'S BEEN USED AS A DIPLOMATIC TOOL. In the early 1970s, ping-pong was used to thaw relations between China and the United States. Much to Western officials’ surprise, the American world champion table tennis team was invited to visit the People’s Republic of China in 1971, where they played a series of friendly matches against the Chinese team. The athletes became the first Americans to visit China in an official capacity since the Chinese Communist Revolution of 1949. This action signified a major shift in international alliances, and led to President Richard Nixon's trip to Beijing in 1972. 10. IT WAS ONCE SUPPOSEDLY BANNED IN THE SOVIET UNION. While ping-pong was embraced by most countries, Soviet Union officials supposedly held no love for the game. It was banned from 1930 to 1950 in the Soviet Union because it was thought to be an ugly game. 11. IT'S A GAME OF SPEED. Skilled athletes can slam a ping pong ball across the net at speeds surpassing 100 miles per hour. In 1993, two players named Jackie Bellinger and Lisa Lomas set a World Record for hitting a ping pong ball back and forth 173 times in one minute. 12. IT'S A CALORIE-BURNING SPORT. According to Weight Watchers, ping-pong is a bona fide, calorie-burning sport. Beginners can expect to burn between 200 and 350 calories per hour of play, and advanced players can burn up to 500 calories per hour, depending on how active the match gets.